That’s the game. 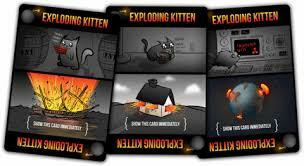 And that’s one of the main things about Exploding Kittens, it’s that when it comes down to it, it’s remarkably simple and easy to learn. 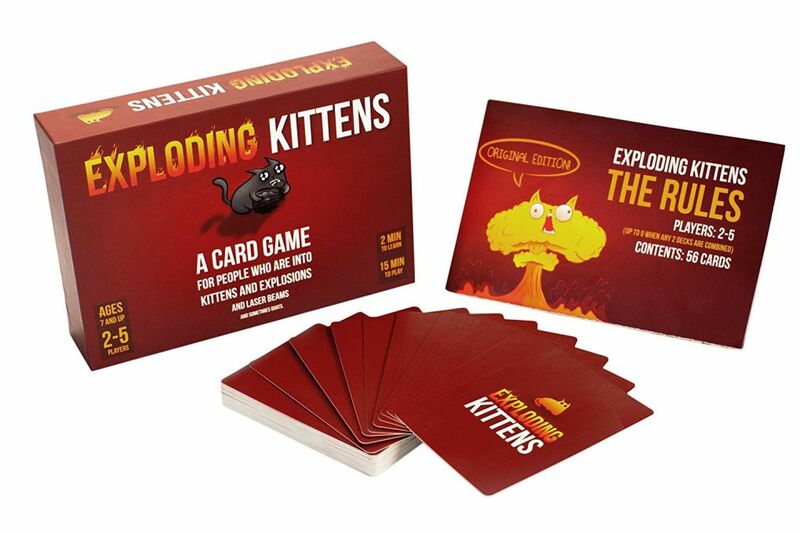 Think Russian roulette with playing cards and you’ve got the premise of Exploding Kittens. Obviously, there is a little more to the game than that and there is some strategy involved. 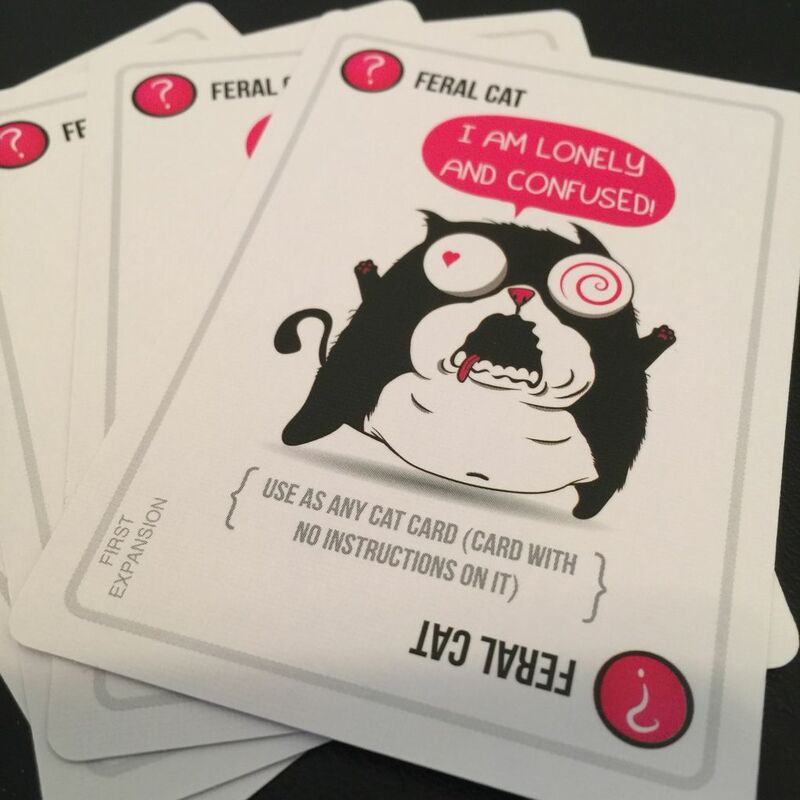 In Exploding Kittens, everybody has a hand of cards that are randomly distributed, except for the “Defuse” cards, of which everybody has one copy. The game begins, and players take turns in a clockwise order, and each turn consists of the following structure: Play Cards (or don’t), then draw a card. Players can choose to play a card from their hand. Or two. Or three. There’s actually no limit to how many cards you can play, so if you want, you could drain ’em all on your first turn. Not that you should, but it’s an option. There are several types of cards with various effects (more on that later), so there is some strategy that’s involved with this. Also, you don’t have to play a card, so this part of the turn can be ignored if you want to. After you’ve played a card, you end your turn by drawing one. This is different from most card games, which typically have you drawing the card at the beginning of your turn. 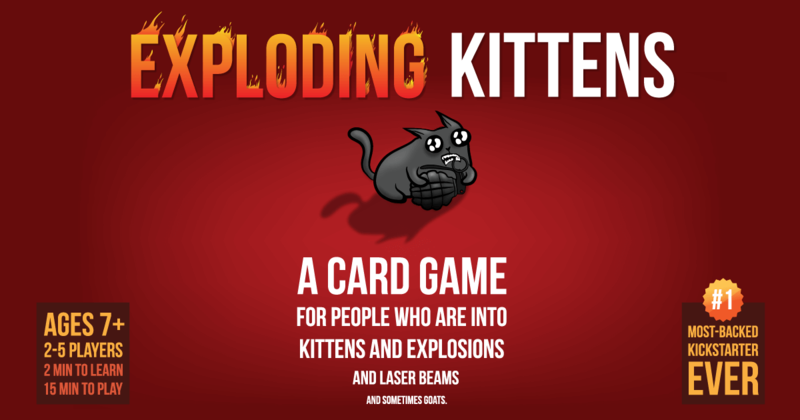 If you draw an Exploding Kitten, you immediately lose the game. Unless you have a defuse card. 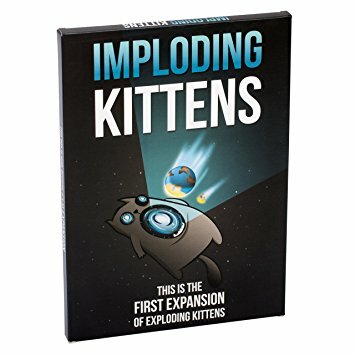 Should you have one in your hand (everybody starts with one), you can take the Exploding Kitten, and shuffle it back into the draw deck wherever you please. This can be kept secret, so if you’re really malicious you can screw over the next player by placing it on top. If a defuse card is used, it’s discarded. The next Kitten you get is blowing up unless you get your hands on another defuse. So, what then? There are ways to give yourself more of a chance, and that’s why it’s important to know the cards. Aside from the defuse, there are six different types of (playable) cards, and each of them can help you out by allowing you to hinder your opponents. Attack cards allow you to immediately end your turn and then force the next player to take two in a row. Skip cards allow you to skip your turn. Favour cards force an opponent to give you one of their cards (of their choice). Shuffle cards allow you to randomly shuffle the draw pile. See the Future cards allow you to peek at the top three cards of the deck (and put them back in the same order). Cat cards have no particular effect on their own, but if played in pairs, allow you to steal a random card from a chosen opponent. 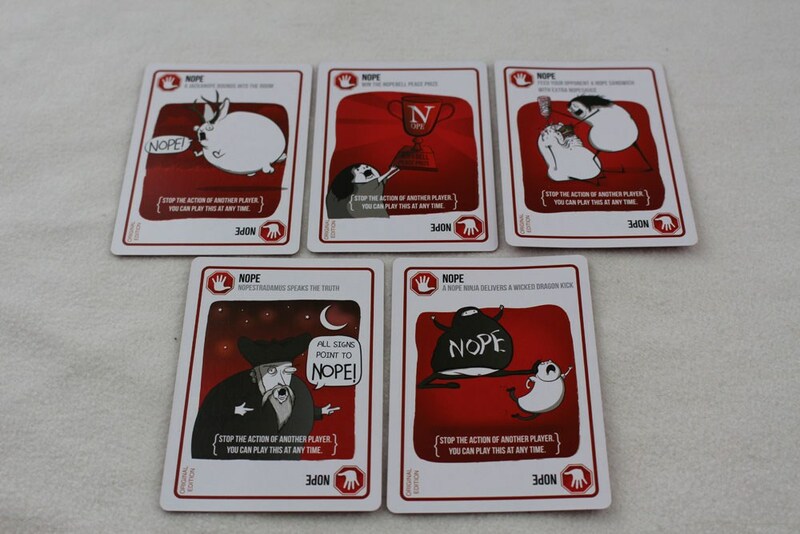 Lastly, there’s a special type of card called a Nope card, which is a card that can negate anybody’s action (save for exploding kittens and defuses). Additionally, you can “nope” a “nope,” making a “yup,” and so on. 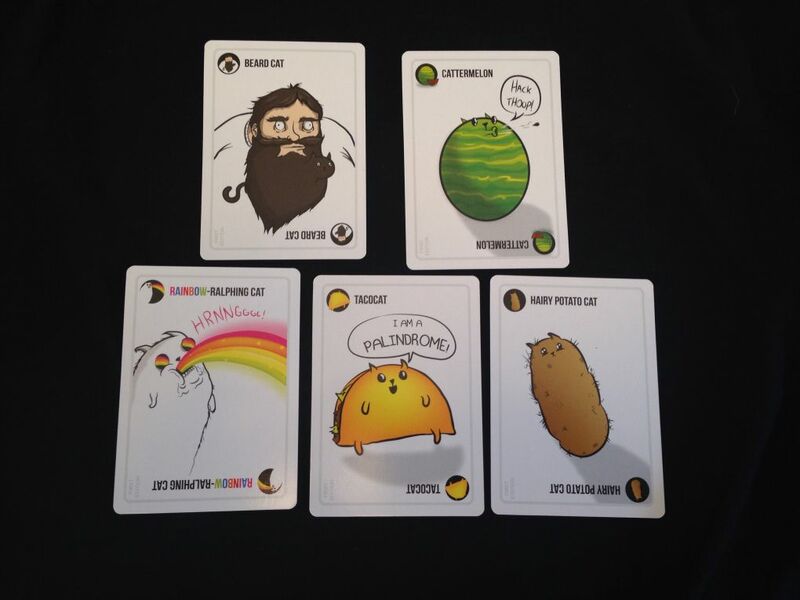 Using the cards in your hand is the key to success in Exploding Kittens. The object of the game, quite simply, is to not get blown up. 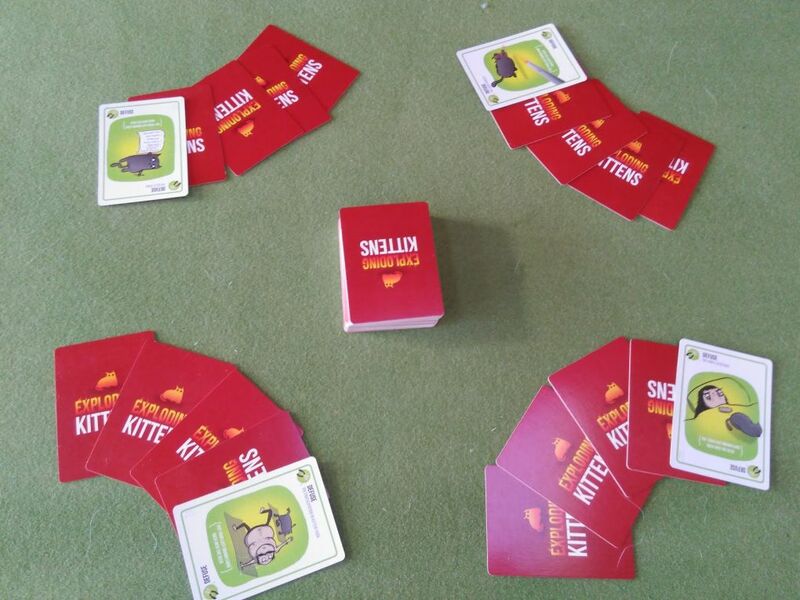 Because there is a finite number of exploding kittens in the deck, the game will always end before all of the cards are used, meaning you’ll never reshuffle the deck. 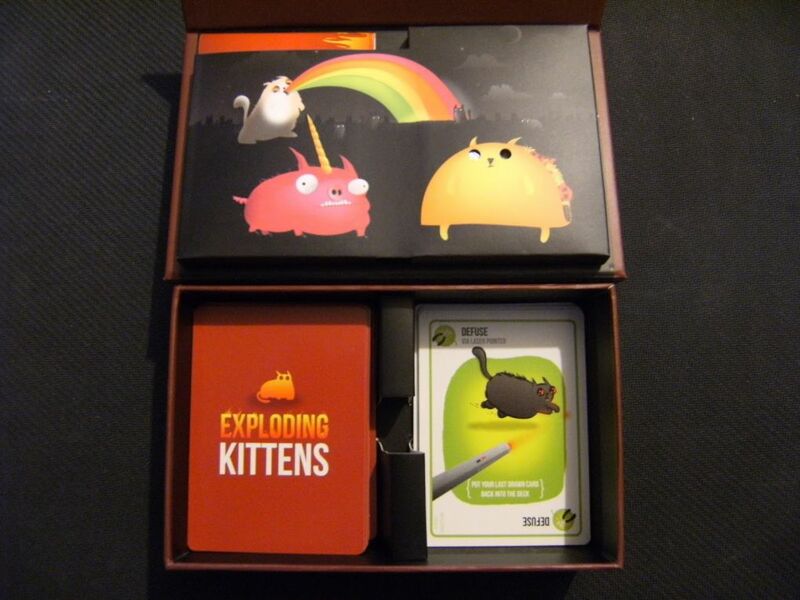 As a result, the deck will get smaller and smaller as the game goes on, increasing the chance of violent kitty death. The smarter you are with your cards, the more chance you have to be safe from blowing up. Finally, there are “special combos” for “advanced play.” I use the quotes because there’s nothing particularly “advanced” about these rules, but they still add more than what you’ll find in the basic ruleset. If you want to make your game more interesting, you can play with these combos: Two of a kind: Any type of card can be played as a pair now (to steal an opponent’s card), not just cat cards. Three of a kind: Same effect as pairs, only now you can name the card you want from your opponent. Great for stealing defuse cards. Five different cards: If you play five cards that are all different from each other (as denoted by icons in the cards’ corners), you can go through the discard pile and pick a card of your choice. 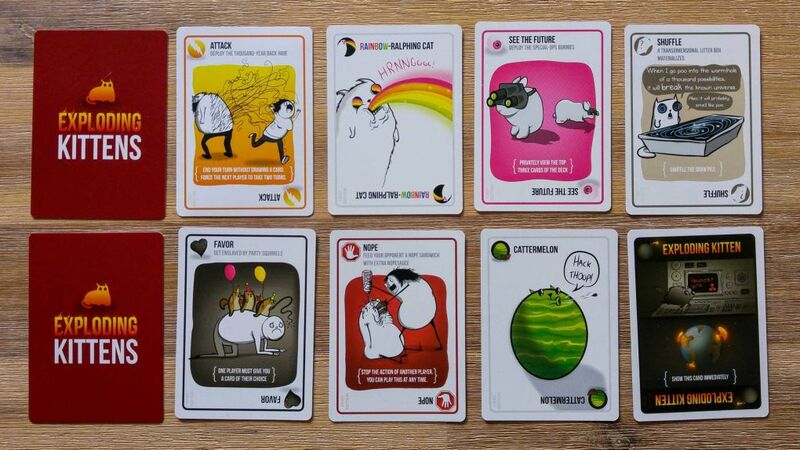 Exploding Kittens is a really fun game to play, and the cards are made to a really high quality and the illustrations from The Oatmeal are brilliant, in fact, if you don’t take time to look at the pictures and read the text on the cards you’re doing yourself a disservice. The packaging is very concise which means it is an ideal game to take on holiday with you. Also because the playing area isn’t that big you could easily play it on an aeroplane table, or around a pool or at a bar on holiday. This entry was posted in Card Games, Me, More.